Driving is a wonderful thing to be able to do but if you are hampered by anxiety then you are always going to have a fear of driving which will slow you down and be obstructive to the rest of your life. You will have a valid reason to have driving anxiety, you are not the first person to feel the way you do and you will not be the last, in fact feeling the way you do is very common. Anxiety can manifest itself in different ways from feeling butterflies in your stomach, sweaty palmed, all the way through to a full blown panic attack. However you feel we can help you take control and feel comfortable with driving. At all times you come first, you will be never pushed into something you do not feel ready for so in a way you dictate the pace. Our driving instructors are very experienced and will always keep you safe, if needed they can take control of the car at any time. You will always get the same driving instructor allowing you to get to know him or her and build a trust, which is going to be really important for you. Of course your driving instructor will never shout at you or show any signs of being impatient, actually your instructor will be kind, considerate and will always be thinking about you and what is best for you. It will not be too long before you start to win your confidence, take control of the car and feel comfortable. Your skills will start to grow and develop, as they do you will find yourself asking your driving instructor to do more and more. Soon you will have moved passed your driving anxieties and be able to drive and pass your driving test. 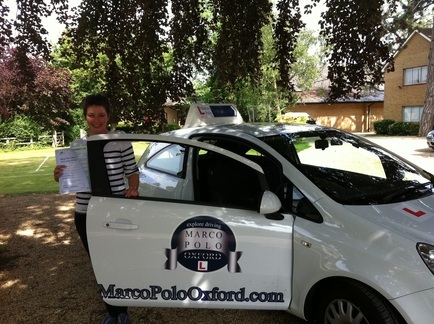 With Marco Polo Oxford Driving School you can achieve your goal of getting your driving licence in Oxford and feeling confident at driving. Contact us today and change your life.